Pursue a degree or take courses in audio and music engineering. 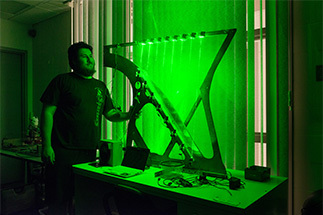 We offer a concentration in acoustics in our MS and PhD electrical engineering programs. In our Music Research Lab, we explore areas like acoustics and music representation. The Computer Studies Building Audio Studio and Rettner Hall Audio Studio are located on the River Campus. View the gear lists or book a studio. Our AME students access the best faculty and resources from the Department of Electrical and Computer Engineering, the AS&E Music Department, and the Eastman School of Music. We will seek accreditation from the Engineering Accreditation Commission of ABET, http://abet.org, following the graduation of the first full cohort of students in 2017. From software development and online companies, to music production and equipment manufacturing, audio and music engineering is an integral part of many industries. When combined, these industries represent more than $360 billion of economic activity worldwide. As a classical guitarist, Juan Estrella ’18 chafes at the constraints traditional instruments place on artistic expression. 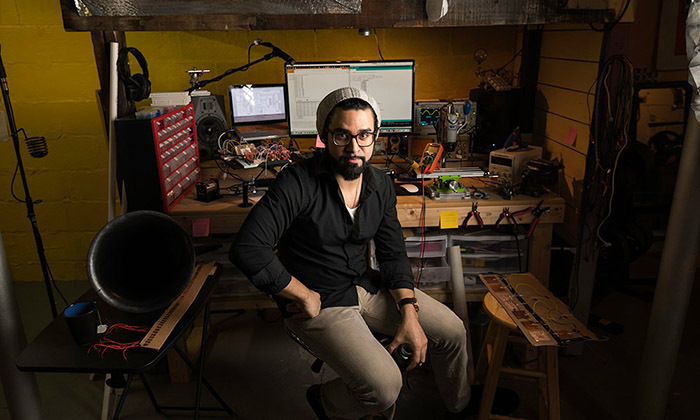 As an engineer, he is attempting to create a “new electronic musical interface” that would set a new standard for instrument design. 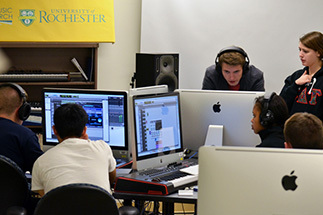 Rochester is the optimal place to combine your interest in music studies and engineering. 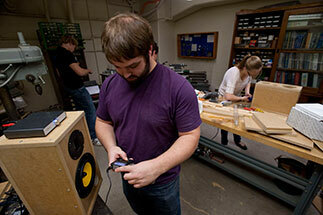 The creative thinking that underpins both disciplines is a hallmark of our audio and music engineering program. The field is rapidly changing, so we teach our students a variety of skills that prepare them for everything from software development to audio production. Audio and music engineering is an integral part of many industries, which represent more than $360 billion of economic activity worldwide. The U.S. Bureau of Labor Statistics reports that job opportunities for sound engineering technicians were expected to increase by 9% between 2012 and 2022. Audio and music engineering is a rapidly changing field. There is a burgeoning need for sonic media engineers in growing fields such as online music companies, consumer audio products, the broadcast and entertainment industry, and the video game industry. Want more information about Audio and Music Engineering Contact us.